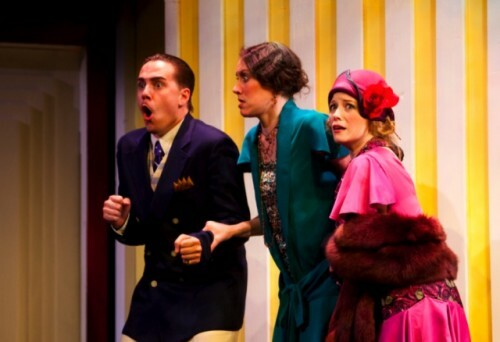 Missing suspenders, snapped frilly garters, a revolving bed, a man who can’t pronounce his consonants – Georges Feydeau’s “A Flea in Her Ear” takes some uptight French aristocrats and rattles them around in the Frisky Puss Hotel. It’s a tightly constructed “bedroom farce” that Constellation Theatre Company attacks with frenetic physical comedy. Lots of scenery is chewed in this production, but that’s a good thing! Woeful Raymonde Chandebise (a sprightly Katie Atkinson) suspects her husband is unfaithful, because he’s stopped fulfilling his conjugal duties. Until she solves the mystery of his failed desire, she can’t rest – and certainly can’t take a lover until her mind is at ease! Devising a ruse with best friend Lucienne (Heather Haney, butter wouldn’t melt) to catch her husband in the act, she sets off a series of wildly implausible and ever more ridiculous situations of mistaken identity. Don’t bother trying to keep track of it all, just let the riot take over. Anchored by a strong cast all showing great vocal and physical command, the production is clearly rooted in the world of farce. I honestly laughed to tears at several points. It makes for a truly hysterical night at the theater. Director Allison Arkell Stockman has encouraged a top-notch ensemble cast to go over the top, and it results in some brilliantly funny performances. I always hate to highlight individuals when an ensemble is so good, but… Michael Glenn has the luck of portraying both the imperious Victor Chandebise and blatantly goofy bellboy Poche, completely dedicated to each ridiculous turn. Matt McGloin is outstanding as the hapless Camille, a man doomed to speak with no consonants. And Joe Brack plays loverboy Romain Tournel as if Errol Flynn were possessed by the Cheshire Cat. The feverish physical comedy reaches a crescendo in the very funny second and third acts, punctuated by outlandish one-liners and frisky innuendo. My only two quibbles were that with actors reaching further and further over the top, sometimes there isn’t anywhere higher for them to go – and with two intermisions and a running time of just under three hours, it’s a long evening for a comedy. But, I’m not sure how much you could cut out and not lose the complicated plot or every character’s moment in the comic sun. These are small quibbles for an engaging company, and I look forward to seeing more. So, a little depressed with the change of season? Overworked and looking for something frivolous and light-hearted? This is it, far better than therapy.